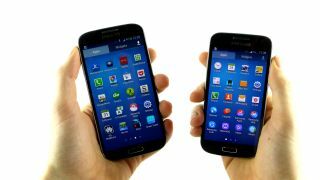 Samsung Galaxy S4 vs Galaxy S4 Mini: Which is right for you? Which Galaxy S4 variant should you choose? Not long after launching the impressive Samsung Galaxy S4 flagship, the Korean firm followed it up with its baby brother, the Galaxy S4 Mini. Both are impressive handsets in their own right, but how do you know which is best for you? Power-hungry consumers will probably be tempted to go for the Galaxy S4, not least for the all round superior specs, whilst thrifty users may opt for the S4 Mini based entirely on the cheaper price. But that's a very black and white outlook; price and specs only paint half the picture. In a bid to help colour in the rest, here's our guide to picking the right handset for you. It shouldn't be a surprise to anyone that both the Samsung Galaxy S4 and Galaxy S4 Mini follow the same design frame, with the S4 Mini coming in as the smaller model. It's almost as if Willy Wonka has tried to beam the Galaxy S4 to our TV set via the airwaves. Both devices follow the typical curved 'inspired by nature' look taken from the Samsung Galaxy S3, with the home button sitting at the base of both between the menu and back buttons. The big design difference is undoubtedly their respective sizes. The Galaxy S4 comes with a 5-inch screen, popped into a chassis measuring 136.6 x 69.8 x 7.9mm and weighing 130g. The S4 Mini comes with a smaller screen wrapped in a 124.6 x 6.3 x 8.9mm-sized body and comes in at just 107g, making it feel a lot less wieldy in the hand when you hold both side by side. This lack of weight will likely be heavily linked to the traditional plastic build of the Galaxy range. We've commented that the plastic feel on previous Galaxy flagships makes them appear a little cheaper than their high end rivals. The problem is somewhat reduced on the S4 Mini as the plastic is more befitting the midrange price tag. First impressions when picking up either of the Galaxy's is just how light they are. We often comment how added heft can lend a more premium feel, but both feel well-balanced in the hand. That larger frame does mean that the full fat Galaxy S4 will sit more awkwardly in the appendages of smaller beings; the Galaxy S4 Mini is also far easier to operate one handed. The Galaxy S4 does also come with a feature that we are becoming increasingly attached to; a notification light. Given our near surgical attachment to our devices, having a little light that flashes means we no longer need to keep checking the S4, and that's sadly missing on the S4 mini. In short, both the Galaxy S4 and Galaxy S4 Mini are well designed, attractive handsets (as long as you don't hanker after a metal body). The plastic construction is more suited to the Mini, although it makes the S4 deceptively light. Add that to its immense thinness and we can see both sitting happily in the pocket of a pair of skinny jeans. Without turning the screen on, the only noticeable difference is the added screen real estate that the Galaxy S4 offers. The extra 0.7-inches mean that the S4 screen towers over that of its Mini brethren. Samsung's smaller model is far more akin size wise to Apple's iPhones. Since 2012, the Cupertino firm's handsets have sported 4-inch screens; those jumping from an Apple device may find themselves more accustomed to the S4 Mini. As we mentioned earlier, the added space of the flagship does mean that the Galaxy S4 sits slightly more awkwardly when trying to use one handed, or in the palms of a smaller individual. Teens will definitely find it easier to type on the Galaxy S4 Mini. The smaller size does make it slightly more difficult for those with larger fingers to operate though, with bigger digits being far more suited to the Galaxy S4. Size is not the only differentiating factor between the two screens; the resolution is likely to play a very important part in a decision in which version of the S4 you opt for. Both handsets come with Samsung's Super AMOLED display, although the S4 comes with a Full HD 1080 x 1920 resolution. This gives it a whopping 441ppi, dwarfing the qHD 540 x 960, 256ppi S4 Mini. However, thanks to both using similar screen technology (Super AMOLED screens for rich contrast and colours) the sharpness disparity is dulled somewhat, making both decent to look at - although movie watchers will prefer the S4. For those just looking to invest in a device with communication as the priority, the Galaxy S4 Mini is more than up to the task. The screen is bright enough and clear enough to send texts and emails, as well as for internet browsing. The extra screen space and resolution is far more important for those looking to do heavy web browsing and large movie collections. Whilst the Galaxy S4 Mini screen is more than up to most tasks, bouncing between the two does highlight the effect of the lower resolution for these tasks. Video calling is also more pleasant on the Galaxy S4 than the S4 Mini because of the screen. Contacts shouldn't notice much difference given the minor difference in camera size (2MP vs 1.9MP), but you'll be able to see much more of your loved one's face on the S4. A few other neat tricks have been added to the Galaxy S4 screen too, with the ability to swipe between screens without touching it, as well as being able to operate the S4 with a pair of gloves on. In colder climates, the Galaxy S4 may be more appropriate for those without touchscreen-friendly gloves. In a simple camera specs race, the Galaxy S4 was always going to win hands down. It comes equipped with a 13MP sensor as opposed to the 8MP sensor that graces the S4 Mini. Both come equipped with the same LED flash however. Samsung has also put a few more of its fancy camera modes found on the Galaxy Camera into the S4. The Drama mode, Animated photo and Eraser modes are all missing from the Mini, with the Galaxy S4 also gaining the dubious 'picture in picture' mode. If you're looking for a phone that can put the photographer in the same snap as the subject, the S4 is definitely the one for you. In terms of forward facing camera's, the difference is far more subtle. The Galaxy S4 comes equipped with a 2MP sensor, with the S4 Mini coming with a 1.9MP sensor, so video calling should be a similar experience. As a pure point and shoot device, both the Galaxy S4 and the Galaxy S4 Mini are up to the task, but side by side it is immediately obvious which handset takes the better pictures. The added mega pixels in the Galaxy S4 really do make a difference. Both images are clear, but extra detail on the goose's feathers is easy to see, and the detail on the surface of the water is also more prominent. The detail on the tarmac at the bottom is also clearer. Colours appear much richer on the Galaxy S4, with the contrast levels much higher. The grass in the background is less faded, and the orange and blue on the life ring are a lot deeper. In lower light areas, both the Galaxy S4 and S4 Mini seem to struggle a little. The Galaxy S4 manages to pick up more detail though, and the edges of the trees are a lot crisper against the sky. Both pictures are decent in HDR mode, although the Galaxy S4 Mini gains a warmer tone indoors. Smaller details on the fronts of cars are clearer, and the wheel spokes are also crisper on the S4. Its got half the amount of cores, but does that really matter?